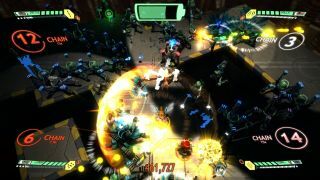 Frenetic twin-stick shooter Assault Android Cactus will arrive on PC on September 23, as the launch trailer above attests. You have to wait until 1:30 in the trailer to reach the "holy moly lasers" moment, but you'll probably know if it's for you or not in the 20 seconds that follow. The premise is simple. Robots have gone beserk aboard a space freighter, and as a droid working on behalf of the interplanetary cops it's your job to put them out of commission. With lasers. Maps bounce, wobble and rearrange themselves around you, but you have to push on regardless to keep your ever-draining energy bar full. Snaffle the batteries enemies drop to stay alive and kill everything. AAC is in Early Access at the moment, but will launch with eight characters, 25 levels and the option to play with up to three other friends for even more lasers. You can try before you buy with this playable demo on Steam.